Opera at the Ballpark, 2010. Source: San Francisco Opera Facebook. Photo by Cory Weaver. An ongoing concern of performing arts managers is the impact of arts participation and engagement programs on creating new audiences. Specifically, arts organizations are concerned as to whether or not their efforts elicit new patrons to attend performances regularly. Concerns exist in particular about the overall impact of engagement programs like simulcasts, wondering if new audience members are attending these events at all, or if the events are drawing the same group of people that come to staged performances. Furthermore, a growing discomfort exists that opera simulcasts might actually be “cannibalizing sales,” or in other words, reducing ticket sales at live opera performances. My previous post mentioned that people attending San Francisco Opera’s simulcasts (“Opera at the Ballpark”) could sign up online to gain early admission, and by doing so allowed the Opera to obtain information about its simulcast attendees. In 2007, the Opera moved its simulcasts from Civic Center Plaza to the AT&T Ballpark, taking advantage of the closed venue to get a better sense of the people attending. Since then, they have simulcasted at least one performance annually, with two performances in 2009 (“Tosca” and “Il Trovatore”). The Opera tracked both the total number of people coming into the ballpark to watch the simulcast (Total Attendance) and the households who signed up online for early-admission tickets that were not already in their database (New Households). The table below shows, per simulcast, the number of new households and the total attendance of each simulcast. *New Households describes early admission sign-ups from households who had previously never been to the SF Opera or an SF Opera simulcast. **Total patron attendance per simulcast; numbers pulled from an SF Opera press release. Considering the opera industry’s concerns, these data suggest that SF Opera’s simulcasts are indeed reaching a new audience through its series at AT&T Ballpark. “Tosca” drew the greatest number of new households, with nearly 11,000 new households in attendance in 2010. While the data do not convey the total number of people that were new at each simulcast—only the number of new households (which could be comprised of one or multiple persons)—they do provide an indication of the approximate amount of new audience members the Opera at the Ballpark series is drawing. 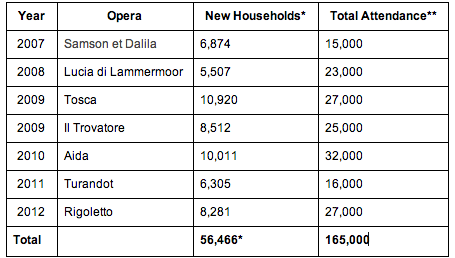 For instance, even though “Lucia di Lammermoor” drew only 5,507 new households, the smallest number of new households so far, those households comprised, at a minimum, 24% of the audience. However, these data do not tell us if new households are purchasing box office tickets after watching a simulcast, nor does it tell us if sales are being “cannibalized” (if regular opera patrons are choosing to attend simulcasts in lieu of live performances). Even so, the results are promising for those wishing to know if arts engagement programs are attracting new audiences. It will be interesting to discover if other organizations have achieved similar results with their simulcasts, and whether or not they experience a positive effect at the box office.